Navigating the landscape of modern nutrition can feel like walking through a mine field. It’s almost impossible to make it through a day without encountering a nutrition study or food-related story. Hunger, obesity, contamination, crop damage, higher prices, processing and genetic modifications are all hot topics today. Food can cause allergies, disease and medical conditions – or cure them – depending upon which studies you read. Sometimes what was good advice a generation ago has been reversed today. And everyone seems to be dieting or giving something up. Right? Farmers and gardeners have traditionally known that food fresh from the garden tastes better. It’s also commonly known (but sometimes forgotten) that produce is best used when just picked and is available only during a limited growing season. For hundreds of years, people ate local, fresh, delicious and available food. Whether you personally feel it’s a benefit or not, the availability of fresh corn in February or avocados and oranges during a New England winter is a relatively new phenomenon. So are huge freezers and refrigerators, but I’m not ready to give those up, and I’m guessing you’re not either. But, walking away from most packaged and processed food has not been difficult lately, and the effort to cook “real” meals from “real” foods has been rewarding as well as delicious. So has bread baking, harvesting produce from the backyard Aquaponic growbed, and taking the time (not really that much!) to make fresh spaghetti sauces and simmered-all-day soup. I was a “modern” homemaker for a number of years, raising children and maintaining a busy household as well as running a business. I used every cooking shortcut I could find – from packages to mixers and microwaves; even take-out and eat-out on a regular basis. But there was some common sense involved as well. The trade-off was (and still is) important – scrambled eggs and fruit for breakfast; pizza for dinner. Or, perhaps a packaged protein bar for breakfast and homemade soup for dinner. Our ancestors instinctively knew that food and fellowship were related. They worked hard, they ate well; they lived well because they enjoyed pleasant family times together when the hard work was over. A social occasion always involved food – and lots of it, as the descriptions of family reunions and the old recipes and their portion numbers attest. We all have an opportunity to eat well and feel better. Based on what we harvested recently: Tomatoes, Onions, Eggplant, Yellow Squash, Bell Pepper, Okra and Basil. Wash and chop all veggies into bite-sized pieces. 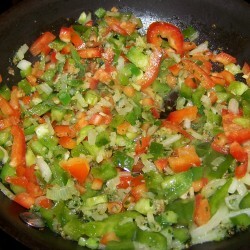 Dice celery, carrots and onions and sauté them in olive oil together with finely-chopped garlic. 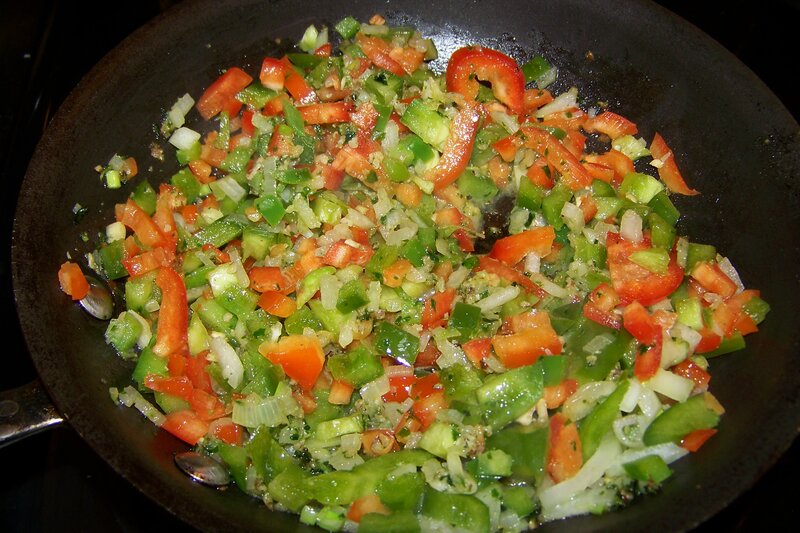 Lower heat and add all vegetable pieces except mushroom, stirring frequently until just tender. Add mushrooms and a bit of the tomato bouillon (maybe ½ cup, or just enough to moisten the vegetable mixture – you do not want a soup). Cover and let steam for just a couple of minutes. Garnish with chopped, fresh basil. Serve as a side dish, and top with a little parmesan cheese if desired. Lia Jonsson’s weekly column debuts today. With all of us at Green Phoenix Farms, she acknowledges the benefits of good food – growing it, cooking it, eating it and sharing it. She will explore such diverse topics as diet, nutrition and health, innovative agriculture, food and fellowship, the varied history of food and diverse food traditions. She will weave in some stories of her Norwegian and Swedish farming ancestors, inspiring you to spend more time in the kitchen and enjoy good times around the table; and there will be a variety of family-tested recipes as well, many of them using Aquaponic system harvests. Lia welcomes your comments and ideas. Contact her at Lia@greenphoenixfarms.com.